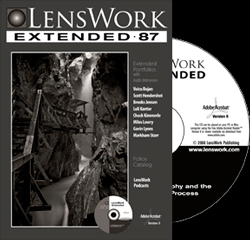 The latest version of Lenswork is out on DVD. If you are not a subscriber to the extended DVD version of the venerable LensWork publication, you are missing out on some great photography and features. Also of note are the ongoing folio presentations and Brooks Jensen podcasts. In this issue we were very impressed by Kimmerle’s The Unapologetic Landscape and Hendershot’s Architecture. Checkout the new “LensWork Creative Labs” feature. A nice surprise was to see another visit to Mark Starr’s excellent fishermen series with a new offering In History’s Wake. We will be interviewing Mark in the near future.